I kept asking myself, “How could there be a marathon?” And the answer in my heart was always, “No, there just can’t be.” I had already accepted the marathon would be cancelled even though an official announcement was yet to be made by NYRR CEO Mary Wittenberg. She never made it. Mayor Bloomberg insisted it was going forward. NYRR sent newsletters to confirm that it was on. I just couldn’t believe it. And then an angry mob began hating on runners. I had Facebook Friends post about tripping runners, protesting at the start line, blocking the course. The general sentiment that echoed in my head was: “Running the Marathon is a disgrace. It is an insult to every New Yorker who has suffered in any way.” This is not the spirit of the NYC Marathon. The marathon was founded on bringing together all 5 boros of NYC. I was very conflicted. At Friday afternoon’s press conference (2 days before the marathon) Mayor Bloomberg continued to insist the marathon would happen. So I took a deep breath and began a 3 hour commute into NYC to the Javitz Center for the expo where I would pick-up my bib. This was supposed to be a thrilling process and instead I was masking feelings of dread and sadness. Minutes after receiving my bib, while at a cash register with my sister paying for some running items, a friend called to say the Mayor just cancelled it. I was beyond relieved and also sad and angry. Why wait so long to make a decision? We were a group of strangers and yet we organized quickly and smoothly and adapted to any change of plans. One of the great things about runners is that we are very familiar with organized chaos (on a race course thousands of runners weave past one another; in training a lone runner dodges the surprises of urban streets: cars, dogs, pedestrians, potholes) and being corralled into groups (12:00 pacers go to the back; sub-8:00 pacers to the front). We are also task-masters (give us a training plan and we will get the job done) and highly goal-oriented (when’s the next race so we can plan our strategy to cross that finish line). There were at least 500 runners that flowed off the ferry. The orange river poured outside the terminal where everyone organized into smaller group’s based on which area they were going to help. My group chose to run into the Oakwood Beach area. As we ran into the residential streets where homes were completely shredded apart my heart dropped. There were no signs of FEMA, Red Cross, government personnel, military officials… I don’t even know who should have been present around such a catastrophe. All I saw were lots of neighbors helping neighbors in every way possible. With our backpacks stuffed with supplies, one of our fellow-runners even had a twin-baby stroller stuffed with items, I sort of felt like the cavalry. These folks clearly needed man-power desperately. It was amazing to see my community come together. There were teenage girls walking the streets with trays of coffee to hand-out; packs of men walking with shovels and gloves ready to move debris; older women setup tables in front of their homes where food was on display for anyone to take (“Want some baked ziti? I have hot lasagna here!”); pick-up trucks with out-of-state license plates were cruising the streets looking to help provide man-power or unload supplies. We started by asking each homeowner what they needed and how we could help. A very simple question that sliced through an onion of raw, burning pain. Some folks were too emotional when asked the question. Other’s were too proud to take anything so I had to be persistent. Quite a few apologized that I couldn’t run ‘my marathon’ and I told them not to even give it a thought. I could care less. I want to help and I have strong legs so tell me where to run and I’ll get what you need. There were make-shift supply distribution hubs (usually at street corners) that had collected cleaning supplies, clothes, food. I grabbed a bucket, bleach, gloves and sponges. I started trotting around through the streets passing out items. Sometimes I’d stop at a home to help clear debris, other times I would ask someone what they needed and run back to the make-shift supply hub to get the item. Would-be New York City Marathon runners instead pitched in to help storm victims on Staten Island. I wore my orange marathoner shirt. Funny how orange was the color for the 2012 marathon. It’s also the color for Staten Island, thanks to the bright orange ferries. A year ago I was IN to FINISH the ING NYC MARATHON 2012. Here is my blog post that started the journey: http://bit.ly/SKcjuw. I have spent the entire year mentally and physically preparing for Nov 4, 2012. The day was supposed to start on Staten Island and take me on a course through all 5-boros, finishing in NYC. God had another course for me to follow that started and ended in my own backyard, on Staten Island. Helping my neighbors was the best way I could have put all my pent-up energy to a positive purpose. I will run the NYC Marathon in 2013 and come back better, faster and stronger, just like New York City. FINISH LINE PHOTO: Me and my sister wearing our orange marathoner shirts, the same color of the Staten Island Ferry, after the most unforgettable day helping our neighbors. I’ve actually been following your blog for a while now, and I’ve found you heartfelt, inspiring, and a runner I admire and look up to. I never realized how closely our paths have just about crossed though, lately. I did not sign up or qualify for the ING NYC Marathon. I did though, complete my very first 26.2 a few weeks ago in Syracuse at the Empire State Marathon. The course was lovely and I’m proud that I pushed through the pain and made it to the finish line. 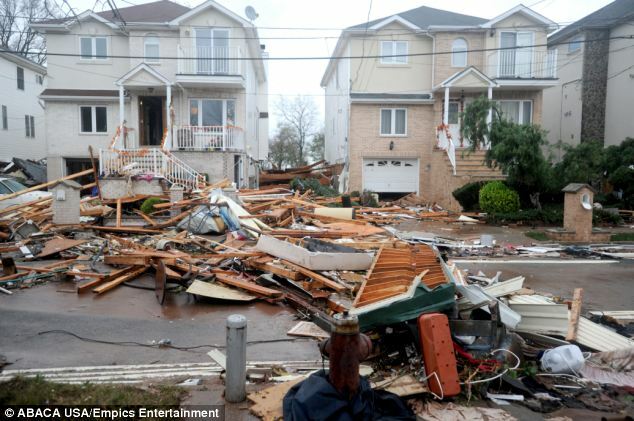 As Sandy rolled in, tearing apart the homes of countless friends and family members, I was heart broken. Then the whole hubbub of the NYC marathon went down. Long story short, I ended up driving 8+ hours to NYC to become a relief worker, and I actually volunteered on Staten Island all last week! Somehow in the chaos of helping and going to all kinds of shelters, distribution centers, and homes of people I’d never met before – I ended up with an ING NYC Marathon teeshirt. After they cancelled the race, we know they donated a lot of items. I hope one day to acquire a shirt from the NYC Marathon the old fashioned way: through 26.2 miles of blister-inducing running! But for now, I’m proud to have my Maple-leaf shaped medal and a teeshirt that shows I was there to help and I did my part to assist those affected by this terrible, awful, destructive disaster. Maybe next year we’ll be running in NYC together! Thanks for your strength, positivity, and level-headedness in response to all the chaos of the marathon stuff… and I love that you’ve been helping your neighbors out. If we all pitch in, the work will get done faster. I’m glad you and yours are safe. I did see a lot of Nat’l Guard, yes! But far and away most people I saw were neighbors helping neighbors! I worked at the community center thrown together at 192 Ebbitts and with crews from 626 Midland as well. We filled a shopping cart with supplies and went door to door, up and down the streets, bringing people brooms, shovels, bleach… anything we had, if they needed it, we would deliver it. If you or your friends/family are looking to volunteer again – please let me know. I’ve been helping to coordinate with a couple groups on SI. and i’ve been following your blog for quite some time now too! thank you so very much. you will get that NYC Marathon shirt one day! i’ll be reading your journey along the way.